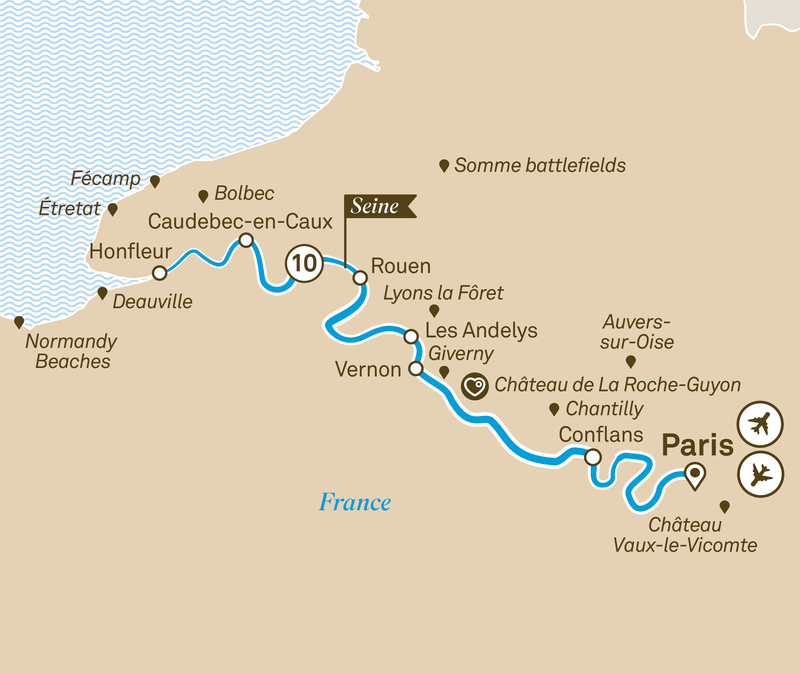 Cruise along the Seine on an 11 day journey from Paris to Honfleur. Tour the historic Normandy beaches and visit Giverny where you can see Monet's gardens. The Seine isn’t the largest river in Europe, or even France, but it may be the most renowned – and for good reason. This splendid waterway cuts through the heart of Paris, before winding its way along some of the most celebrated sites in northern France. There are few superlatives that do justice to beautiful Paris, as you’ll have ample opportunity to discover. Beyond Paris, you can look forward to a serene cruise to Honfleur, by the open waters of the English Channel, pausing at the most beautiful landmarks along the way. Les Andelys, Rouen, Caudebec-en-Caux – all the key points in this itinerary are steeped in history and brimming with charm. However, we’ve saved some highlights – evocative Vernon and medieval Conflans – for the return trip, including one last unforgettable fling in Paris. Get a glimpse of what the Somme battlefields might have been like for those caught up in this terrible World War I battle, which claimed the lives of more than 150,000 British and Commonwealth soldiers. This full-day excursion commemorates the 103 years since, and includes a visit to the Australian National Memorial, containing the newly built Sir John Monash Centre, and the Victoria School in Villers-Bretonneux. Alternatively, explore the collection of Impressionistic paintings, including masterpieces by Renoir and Monet, at the Museum of Fine Arts, which was founded by Napoleon Bonaparte (seasonal option, will be replaced with Joan of Arc Museum when not available). Visit Fécamp and its mighty palace. Situated in spectacular surrounds the city’s natural setting contrasts perfectly with its architectural centrepiece, the Benedictine Palace. Alternatively, travel to the hilltop village of Bolbec and view fabrics at the fascinating Textile Museum before visiting a nearby Normand farm that produces delicious local cider. For the more adventurous, join a guided cycling tour to the charming village of Villequier and visit the Victor Hugo Museum. Discover the charms of Auvers-sur-Oise and see Vincent van Gogh’s room (seasonal option, will be replaced with Chateau d'Auvers when not available), or step inside the magnificent Chantilly Castle for a guided tour of this remarkable château, set amidst beautiful parklands. Alternatively visit the great stables on the grounds of Chantilly, essentially a palace for horses living on the estate. The stables also house a museum dedicated to the relationship between man and horse throughout time. Shop with a Chef when you visit one of Paris’ local food markets, and enjoy exquisite tastings (if not available will take place in Honfleur), or walk the city with a resident expert and hear tales that only the locals know. Alternatively, you may wish to explore beyond Paris and tour the 17th century estate of Château Vaux-le-Vicomte, Louis XIV’s inspiration for Versailles Palace. Featured in the James Bond movie Moonraker, the Palace of Vicomte has been leaving visitors in awe of its magnificence for centuries. Your trip concludes after breakfast as you disembark and transfer to Paris airport. See what sets France apart when it comes to refined culture and delectable cuisine on a luxurious 18 day journey from Paris to the wine region Bordeaux.